Tosa Mitsuoki. 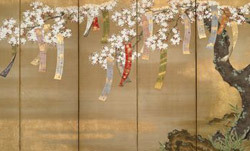 Flowering Cherry and Autumn Maple with Poem Slips (detail), 1654/81. Kate S. Buckingham Endowment. Today I want to tie poems onto tree branches and send their thoughts fluttering.